It’s strange to be mesmerized by the colour green but that is the position you find yourself in when visiting Columbia. The entire country appears to have had the contrast and saturation levels dialed up to leave the strongest impression possible on your memory. Many things can be said about vast, storied country but the vibrancy of the colours is, without a doubt, the strongest impression that this charming, haunting, and unreservedly beautiful country makes. The other thing that strikes you is the immensity of the experience as a whole. In a word Colombia is big. Not big geographically, because there are countries with larger landmasses by comparison, but big in the sense that there is so much to experience; big culture, big personality, big consciousness and, yes big butts-everywhere. You cannot help but be overwhelmed by everything around you. Stepping out of the plane and onto the tarmac in Cartagena you are surrounded by palm trees with a wooden trellis guiding you to the airport building which reminds one of an idyllic getaway; more similar to a small local airport than an international destination serving a city of 1.1 million. The cramped yellow taxis – everywhere in Columbia – go along some of the cities beaches on the way to the old walled city giving you an unobstructed view out into the grey-green-blue ocean that surrounds the city. The air is thick as you are walking through the streets. The smells of deep fried food, and fruit is pervasive. Light salty snacks are available everywhere in Cartagena, you have empanadas, arepas and a copious amount of street meat with vendors that are eager to sell to you (if you are paying more than a dollar for any single item move on because you will find a better deal). Beer the same, a can of Aguila (Colombian brand of choice) should cost you no more than two dollars otherwise move-on to the next vendor or haggle the price down. You will find common ground with either one of these methods. Inside the historic walled city the low-rise buildings packed tight around narrow streets and small squares make Cartagena feel both friendly and mysterious. There are a thousand narrow, winding streets begging to be explored and the contrast of colours make you wonder if Willy Wonka was on the city planning council. Most homes and storefronts have large windows that open on to the street, with the communal atmosphere and the friendliness of the locals, you get the sense that as a local it would be too easy to simply walking past a friend’s or a soon to be friend’s home and join the conversation. The ornate knockers on each door make it all the more tempting formally ask to be invited inside for refreshments and some laughs. The city was built in a time before automobiles and with the confines of the city walls making space extremely valuable. Whether walking, pushing a cart teetering with fresh fruit, riding in a horse drawn carriage or crammed in the back seat of a taxi the streets are shared by everyone. Most beautiful at night, the city is warmed by the glow of street lights playing off the colours of the buildings. If you are looking for a decent meal, head to the restaurants inside the walled city of Cartagena. There you find set prices, an uncommon luxury, and well trained chefs for a well formed seafood meal select choice of libations. Street performers and entrepreneurial musicians make the evening more exciting mingling with restaurant patrons sitting on patios that spill directly into the squares. The 17th – 18th century Spanish architecture makes for the most amazing scenery as white accents set of the rainbow of buildings. Balconies overlooking the streets make it easy to imagine sitting and observing the comings and goings of those on the street, or chatting with the person on the balcony across from you, as you sip on a glass of the local refreshment of choice, Aguardiente. The ocean and beach at Playa Blanca are astounding; azure waters and the white sand beach could not be more post card Caribbean. However, with the crush of humanity is sitting just above the high water mark with a continuous line of hostels, bars, restaurants and juice stands set up in questionably constructed wooden shacks, finding a spot with a little bit of shade and some breathing room from the people trying to part you and your pesos is not an insignificant feat. Once accomplished, a more idyllic location could not be found. All of the daytime tourists leave in the early afternoon which means that you have the sunset all to yourself. After the sun goes down the beach bars stay open well into the night until you choose to go to bed; the lapping waves sending you to the Sandman while you rock in the seaside hammock. If you can find a better place to sleep for the night…… I don’t know what I will give you but it will be good. 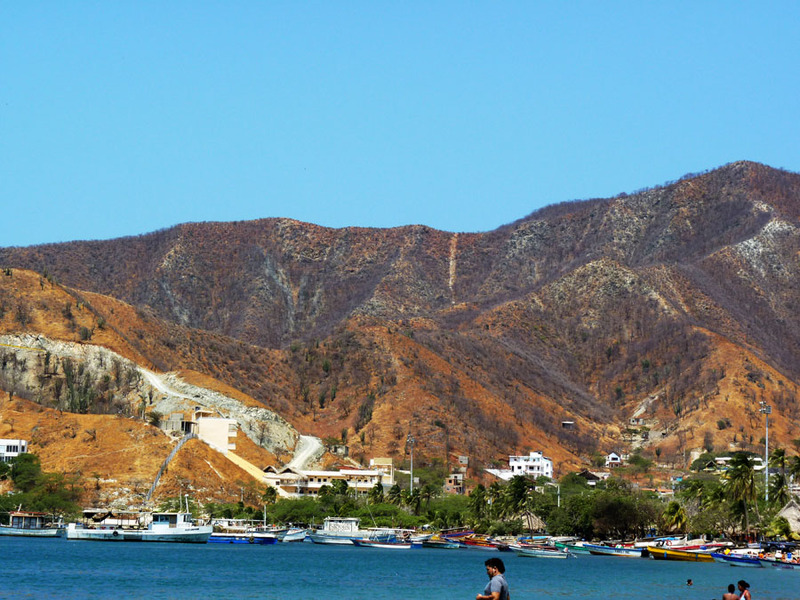 In the small town of Taganga you will find the restaurant Pachamama. This restaurant is tucked away on a side street just off of the main strip. The décor fits the mood of the community as well as your favorite well-worn slipper but the food is right out of the kitchens at the Cordon Blue. Treating yourself to the steak is the best decision you will make all night, as you will never have a steak so well prepared in such unassuming surroundings. Moreover, the bill totals the equivalent of fifteen dollars with plenty of drinks included. This is a restaurant that would make headlines anywhere in the world but somehow fits perfectly in this small ocean side town. That is the attitude you get almost anywhere you go in the country. The people seem proud to be Colombian, engaged in the reality of their lives and what they do but not boasting or braggadocios about the fact that theirs is this sunshine paradise of the world. Colombians enjoy their communities, live their happiness and are focused on making it even better than it is. There is of course significant poverty in the country but finding those who do not seem to enjoy what they were doing proves difficult. From the man selling you street food to the shop worker became overly familiar with these ‘gringos’ buying up all his aguardiente, to the hotelier eager to make sure you were comfortable even though your air conditioning was on the fritz; the common human experience rang through all of them and they appeared to want to know enough about you without being a nuisance. Case in point- on the third night in Cartagena we decided to go out for salsa dancing. Like any other night anywhere in the world we had a few drinks on the way to the salsa bar, however we ran into a group of people who seemed to have the same idea. Making friends with Mario and Pablo we managed to communicate to them, through broken Spanish that we are going out to dance. Being the hospitable Colombians they were they lead us to one of the best places in town and even helped us with our moves. I find it hard to believe that anyone would be willing to struggle through a language barrier so thick to help a stranger minimize their embarrassment at a local dance club but this is the hospitality you will find in such an enchanted country. On a side note if you are going to go for salsa in Cartagena go to Club Havana – unbelievable house band. The hike to the beaches and campsites in Tayrona National Park is not to be missed the boardwalks through the jungle certainly provide easy safe walking while still allowing for plenty of opportunity to see small animal life, and it is just enough of a jungle expedition to satisfy the casual hiker without the unpleasantness of having to clamber and push your way through actual bush. 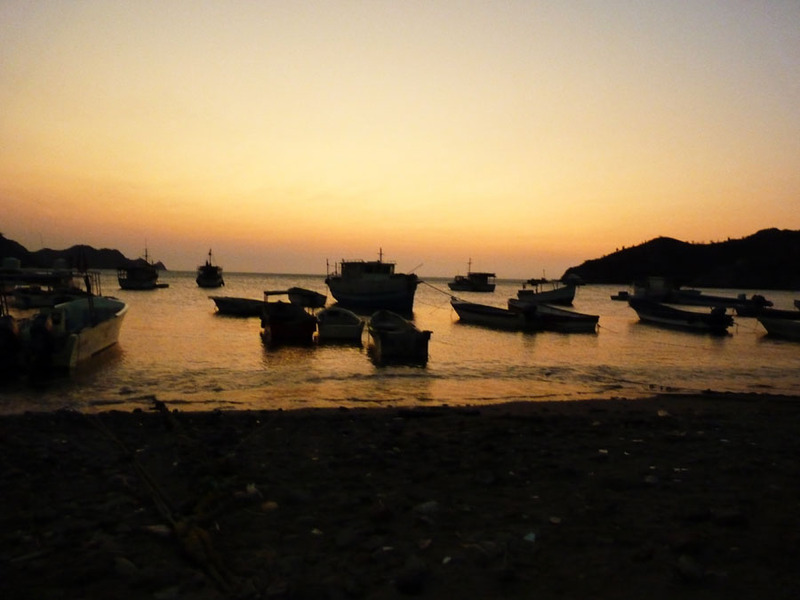 Taking the boat from Tayrona back to Taganga is a marvellous experience though not for the faint of heart, the rough waters at Tayrona make for an exhilarating departure from the bay and crashing through the surf the boat doesn’t quite seem big enough. Once you are used to the cadence of the waves, the opportunity to see dolphins at such close proximity, and for such a low cost is an opportunity not to be missed. Sitting on the starboard side of the boat allows for a spectacular view of the pristine, mountainous coastline with rough surf crashing against steeply eroding cliffs and the occasional secluded beach. 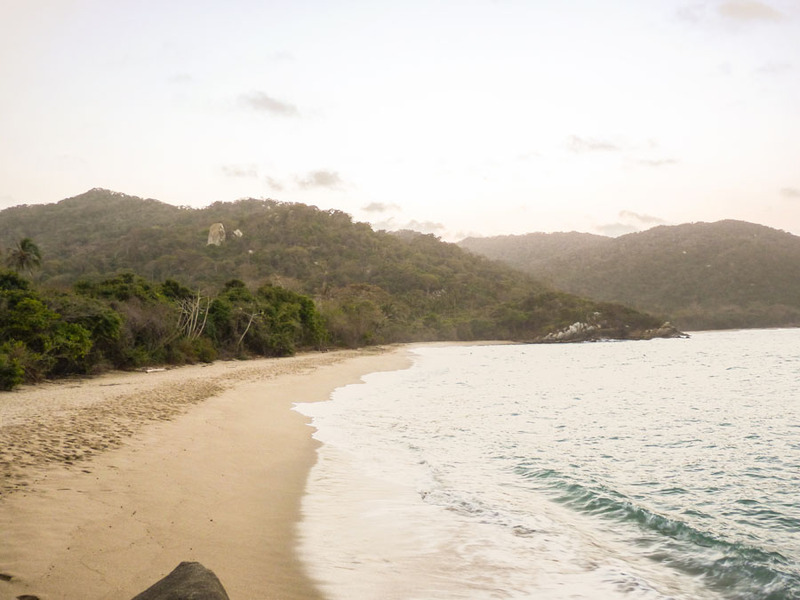 As you head west around the point of Tayrona park the jungle thins out into cacti and scrub brush giving a visual representation of the contrasts and diversity that is everywhere in the country. The beauty, magic, and diversity of Columbia insists that no matter how much of it you see, you know that there is more to discover if you just had a few more days, or a slightly better grip of Spanish. It is clear that the country still has many problems; the desperation the street and beach vendors shows, and on the outskirts of every town there is an expanse of corrugated metal shacks. But it is well on the way to becoming a perfectly safe and developed country, however, thinking of the changes that will take place also makes you a little sad as that development will bring the less adventurous and more sterile parts of global culture to the country, and that will in some ways inoculate the magic of the country. Needless to say – going back is a must. The only regret is that ten days is much too short of a time in this bastion of calm and humanity. On the next trip Spanish lessons are in order because I am sure a place such as this, with people such as these, with such natural beauty; there is more that this country has to offer and say. The tourist pallet has experienced the starter and now it is time for the entrée.